Alvarez’s casual tone, visceral imagery, and surprising figurative language keeps the reader engaged throughout. We read the “clean envelope” not only as the speaker’s body, but also as memory and the white page itself. The “marring” becomes the site of poetry—each line a stitch on the page. Persephone presses her ear to the earth. the neat rows, methodical as a typewriter. Alvarez resists the poetic tendency to simply name-drop mythic characters in the hopes of giving a banal poetic moment mythic quality. Instead, Alvarez gives the mythic characters personality and depth, setting them in modern-day situations. In a sense, Alvarez allows us to imagine Demeter and Persephone as truly mortal. Alvarez stunningly balances life’s precious moments with the equally precious moments of mortality’s absences. The end of each poem, as well as the end of the book, intimates how even though “light / drains the room / into bonelessness” (57), we must continue to notice the elegance of being alive. 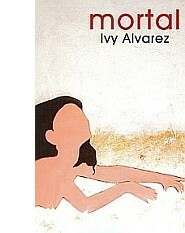 Mortal is a deeply emotional collection that teaches us how “we grow into our scars” (8). Craig Santos Perez's reviews have appeared, or are forthcoming, in Pleiades, The Denver Quarterly, First Intensity, Rain Taxi, Jacket, and Rattle, among others. He blogs at blindelephant.blogspot.com.